I have been avoiding posting on politics of late, being content to chronicle the progress of the carport-widening project. However, with the concrete work done, I'm prepared to announce that I'm taking a public stand on something I consider important. Yes, I'm all in favor of this small increase in my property taxes. (It will cost me less than $20/year.) Fernley's fire department is overworked and underpaid, and covers a fairly large chunk of the county. It's not a city agency, and has no funding other than property taxes and whatever it can scrape up with grants. 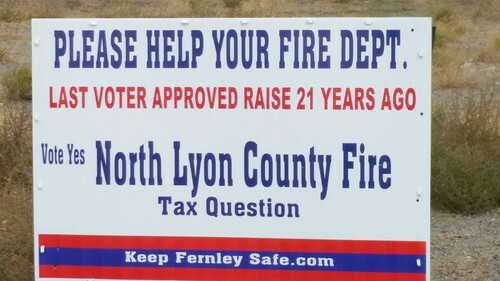 For too long, people have acted as if Fernley was a couple of dozen people who could get by with a bucket brigade in case of a fire, but there are more than 20,000 people here, and we need to keep our fire fighters properly funded. At least I hope that this endorsement won't get my home vandalized, although looking at some of the signs and stickers other people here display, I sometimes wonder.